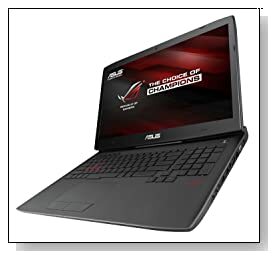 Black ASUS ROG G751JT-CH71 is a powerful 17.3 inch laptop with solid mobile gaming power with a Haswell Intel i7 and NVIDIA GeForce GTX 970M graphics (ROG stands for Republic of Gamers) that will let you play all games on ultra- can handle all games and usual tasks and will work quietly and stay cool at all times, has a great Full HD IPS screen with matte finish, sturdy build quality and superior overall performance and multitasking level of 16GB memory and of course the Intel i7 processor with speed up to 3.5 GHz. ASUS ROG G751JT is offered with the 4th generation quad core Intel Core i7-4710HQ at 2.5 GHz speed that moves up to 3.5GHz with turbo boost dynamically when the tasks at hand require it and four cores can handle eight threads in parallel, 16 GB DDR3 SDRAM at 1600 MHz for super efficient multitasking, 1000 GB SATA hard drive at 7200 rpm rotating speed and Windows 8.1operating system. ASUS TurboMaster technology allows 5% overlocking for even better gaming and you can just switch it off easily for the battery to last longer. Anything you throw at this system will be handled with ease- including the most demanding programs and games. 17.3 inch FHD IPS anti-glare screen with 1920x1080 pixel screen resolution and 178 degree viewing angles offers crisp and clear visuals with beautiful colours and no glare at all and high end enthusiast grade Nvidia GTX970M 3GB GDDR5 with scores of more than 9.3K in the 3DMark 11 performance benchmark letting you enjoy the fastest paced games with sharpest picture quality that can even compare to Apple Retina displays. You will be able to play all games at the highest settings and at 30 FPS and more easily without the machine getting hot or fans making noise. The integrated Intel HD 4600 that comes as part of this Intel i7 CPU is about 30% faster than the Intel HD 4000. Sound quality is quite good too, you have the internal Bass Eye subwoofer for additional low-frequency impact and ROG AudioWizard utility letting you choose the right sound settings for whatever you’re doing and with preset modes for different games. 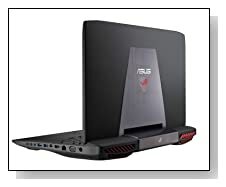 Aluminium finish with an illuminated ROG logo black Asus G751JT with F-22 Raptor-inspired lines looks beautiful, weighs 8.4 pounds with dimensions of 12.50 x 16.40 x 0.90 inches- so it is not a very portable laptop but more of a decent desktop replacement. It has a one piece seamless brightness adjustable red backlit ergonomic easy to use keyboard with programmable macro keys to have convenient access to game recording and frequently used commands and quick-access game keys and a touchpad that feels comfy and works very well unlike on many other machines. Some of its connectivity options include DL DVD/RW/CD-RW optical drive, advanced 802.11ac wireless, Bluetooth 4.0, 4 x USB 3.0 ports, an HDMI 1.4 port (G751 supports 4K2K HDMI output to connect to screens better than FHD), Mini DisplayPort 1.2 (and you can output to up to three screens at once using the Trinity Display- doing three things simultaneously). The two blocks at the bottom make the machine easier to use on a desk but a bit uncomfortable on your lap- both a design pro and a con. Conclusion: ASUS ROG G751JT-CH71 is a great mobile- desktop replacement gaming machine that is fast and powerful and that comes with unique features. It is easy on the eyes with its great design, is thicker than some other much more expensive gaming machines but you will not find many very powerful gaming laptops out there that are also slim. What we have here is the overall performance of Intel i7-4710HQ with a Passmark benchmark score of 7970, 16GB of system memory and the graphics power of GeForce GTX 970M with a score of 3470 on the day of this review- really good for a laptop. It works very quietly and stays cool thanks to the copper heat sinks and dual independent CPU and GPU fans and the way it expels the heat through the rear. Keyboard is very comfortable to use and the ROG key allows you easy access to the Gaming Centre dashboard. It comes with a fast 1TB HDD at 7200rpm but you can replace this with or add SSD for snappier performance and quicker boot-up purposes and doesn’t look like it would be hard to do. Be careful with uninstalling some of the bloatware because although they are not necessary for the functioning of the machine, certain special keys may become obsolete. Battery life is only up to 4 hours from its lithium ion battery but we’re talking about serious power and graphics performance here. It is offered with a 1 year Accidental Damage Protection for accidental spills, drops, fire damage and power surges and 30 days zero bright dot guarantee by the manufacturer. So the Asus ROG G751JT is a computer we definitely recommend despite its minor flaws- good value for dollar.